Wright Medical Artificial Hip Settlement: Wrong for Plaintiffs? Do you long for the days when you could move your legs and hips with complete freedom of motion in total silence, without pain? If the answer is “yes,” there’s a good chance you are the recipient of a hip replacement implant – and you wouldn’t be alone. Over the past few decades, millions of individuals have received hip replacement surgeries, many of which have been successful. But in recent years, there have been a large number of hip replacement recipients who have suffered problems with their hip implants, especially those receiving metal-on-metal hip replacements. Lawsuits have been filed, resulting in large, eye-catching verdicts and settlements for plaintiffs. One recent settlement applies to approximately 1,300 lawsuits involving hip implant products made by Wright Medical Technology (“Wright”). A lawsuit can be a minefield. For one, it can go on for years. And in that time opposing counsel can (and will) challenge a person’s lawsuit in large and small ways. By large I mean bringing “dispositive motions,” which are motions that “dispose” of a case, like a motion to dismiss and a motion for summary judgment. These motions are defensive attempts to kick a lawsuit out of court before it reaches a jury. By small I mean opposing counsel may refuse to produce certain documents or information in the “discovery” process, or may simply use motions or other tools to slow down and delay the plaintiff’s opportunity to have her case reach a jury. But the fight is not over when the jury reaches a verdict in a product liability case. 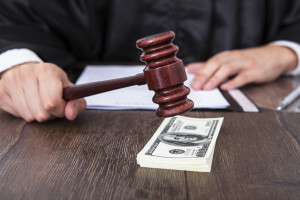 If a plaintiff wins her lawsuit, the defense will typically file “post-trial motions,” and after those motions are heard will likely appeal to a higher court. Merely getting a good jury verdict is by no means the end of the story. Two weeks ago, a federal judge in Georgia stepped in after a jury verdict and stripped almost nine million dollars of punitive damages from the amount of money the jury awarded to the injured plaintiff. But I need to back up.